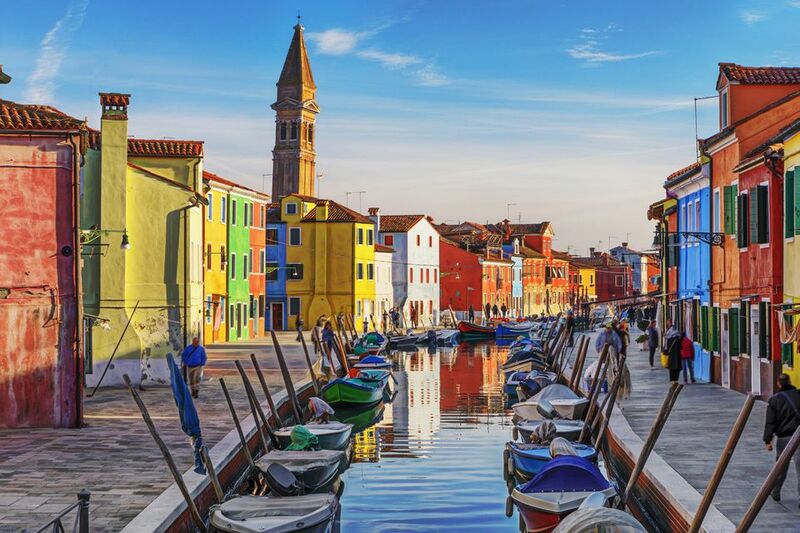 Located in northeast Italy across a group of small islands, Venice has a subtropical climate with cold winters, warm springs, brisk falls, and hot, steamy summers. Although it doesn't rain that much overall (rainfall averages are less than 30 inches a year), the atmosphere is always humid, given that the city is built on a shallow lagoon. During rainy times (especially in fall and winter), the effect of the acqua alta (high water) can present challenges to visitors. Snowfall is unusual, but if it does occur it rarely accumulates for more than a few hours or, at most, a few days. Because the weather tends to be fickle — likely to change from hour-to-hour — it's difficult to predict, so come prepared for anything. Springtime is Venice's best time for sightseeing with long, sunny days followed by cool, pleasant evenings. Spring is also the start of the peak tourist season (after Easter) offering lots of festivals and outdoor events to enjoy. But with the good weather come an increase in the number of visitors and an uptick in accommodation prices to boot. Budget travelers are more apt to find deals and discounts if they plan a trip in early-to-mid March (provided that Carnivale does not fall in March). By April, the temperatures turn warmer yet crowds are still manageable. As for holidays and events to attend in spring, there's International Women's Day celebrated on March 8th, the Feast of San Marco on April 25th, and Labor Day on May 1st. What to Pack: Days tend to be long, bright, and comfy, but it can get cool and breezy when the sun goes down. Bring along lightweight pants, long-sleeved shirts and do stuff a sweater in your bag in case there's an unexpected drop in temperature. A medium weight jacket for evening strolls or gondola rides is recommended, as is a wide-brimmed hat to shade your face from the sun while waiting in line at museums and sights. Summer is the hottest, most humid season of the year in Venice, with the mercury capable of rising to 95 F (35 C) or above. It's also the most crowded season. Hotels charge a premium for rooms and canals are packed to the brim with tourist-filled gondolas, day and night. Not only can the heat be intense, especially at midday, but the canals can emit a rather rancid odor, and mosquitoes are in full force. Fortunately, rainy days are likely, bringing down temperatures for a while. Having said all that, there are some upsides to visiting in the summer. For one, it's the start of the international Biennale: a contemporary art spectacular during which Venice hosts art exhibits, concerts, colloquiums, and other interesting events across the city. Another great reason to visit in July is the Festa del Redentore — a celebration in which a makeshift bridge of barges is built connecting Venice to the island of Giudecca. A fireworks extravaganza tops off the event. What to Pack: Long shorts, sundresses, and cotton t-shirts are in order, but don't forget to bring something to cover your shoulders as churches have modest dress codes. A rain slicker will come in handy during frequent thunderstorms and comfortable sneakers or thick-soled sandals are advisable for the inevitable walking you'll do all day. With dwindling crowds and lower prices for accommodations, autumn is a wonderful time to visit Venice. Keep in mind that it's also the period when the acqua alta (flooding or "high water") is more likely to occur. September can be quite warm and sunny during the day and cooler in the evenings. On the first Sunday of the month, the Historical Regatta — an elaborate parade of boats and rowing races along the Grand Canal — should not be missed. October sees crisp and clear afternoons with breezy evenings to follow. You'll find Italian children celebrating Halloween at the end of the month. As for November, the Festa della Salute on the 21st commemorates the end of the plague in 1631. As the month progresses, it grows colder with a nip in the air that tells residents and visitor alike that winter is coming. What to Pack: Dressing in layers will prepare you for the weather ups and downs of a fall in Venice. Leave your shorts at home, replacing them with warmer pants and long-sleeve tops or sweaters. Rain-friendly shoes or boots, stylish and warm scarves, and caps in case of cooler temps are also recommended. If you're packing skirts and dresses, throw in some tights, just in case. Winters in Venice can be bitterly cold and bone-chillingly soggy, though temps rarely dip below freezing in December. January is about as cold, hovering between 45 degrees Fahrenheit (7 C) and 34 degrees F (1 C), not counting the wind chill factor caused by winds blowing in from Eastern Europe. Rain and snow are expected from time to time, and the high water — a climate phenomenon that pairs rain, strong winds, and rising tides — can result in flooded streets and piazzas. When this happens, wooden walkways are constructed to allow pedestrians to move throughout the city. Winter ends with Venice's famous Carnevale or Carnival, the city's biggest festival. What to Pack: Bundle up with a heavy winter coat (if it's water resistant, even better), a warm hat and gloves, and a thick scarf to protect you from the biting winds that blow in off the Adriatic. Expect lots of sunny days when a light jacket and sweater may be enough, but it's not unheard of to experience snow. Layering is best, and if you can bring waterproof boots in anticipation of acqua alta periods, all the better. For a longer list of events in Venice, month to month, click here.